As shoppers continue to snub the sedan in favor of SUVs, more automakers are wedging them into their lineups. The U.S. version of Mitsubishi's new model, the 2018 Eclipse Cross, hits dealerships in spring 2018. Mitsubishi calls the Eclipse Cross a compact SUV, but the brand already has one of those in the two-row Outlander Sport. The new model slots between the Outlander Sport and three-row Outlander in Mitsubishi's lineup and will be available in four models: the base ES, LE, SE and SEL. Prices start at $23,295, excluding destination, and the model marks the debut of a few new convenience features for the brand. 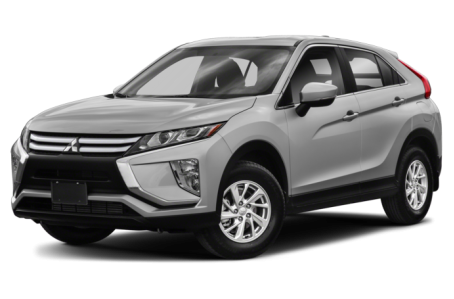 The name combines the automaker's old Eclipse sports coupe with the trending crossover segment, and Mitsubishi's attempt to also combine design cues from both has produced one awkward-looking vehicle. The Eclipse Cross looks a lot like the automaker's other vehicles, with a few exceptions. The brand's large shield grille is front and center, but the new model's face is more intense with gaping foglight inlets, a nose-heavy design in front and wedgelike styling in back. High-mounted taillights that bisect the rear glass contribute to the oddball, angular look that, at certain viewpoints, recalls Pontiac's design-challenged Aztek. Mitsubishi says the Eclipse Cross' interior represents a big leap forward in terms of both materials and design, and that its cabin is the most refined in the automaker's lineup. It sports a wraparound design for a cockpit-like feel, and gloss black trim adds to its sporty look. Other cabin highlights include a 7-inch multimedia screen that sits high on the dash and looks like a tablet; it can be controlled via touch or a console-area touchpad, and is Apple CarPlay and Android Auto compatible. There's also a color head-up display ahead of the gauge cluster. Two new-to-Mitsubishi convenience features are making their debut on the Eclipse Cross: heated rear seats and a dual-pane panoramic sunroof. Also in back, passengers are treated to a configurable backseat that has nine reclining positions and can slide forward and backward nearly 8 inches, Mitsubishi says. A new engine also makes its U.S. debut in the Eclipse Cross: a turbocharged 1.5-liter direct-injection four-cylinder that makes 152 horsepower. The lone engine (at least in the U.S.; a diesel version will be available in Europe) will pair with a continuously variable automatic transmission. Mitsubishi calls the new engine fuel efficient, but has not yet released fuel-economy estimates. A full suite of safety features is standard on the mid-level SE trim and up, but unavailable on lower trims. Features include blind spot warning, lane departure warning, lane-change assist, rear cross-traffic alert, forward collision mitigation, automatic high beams and a multiview camera system.